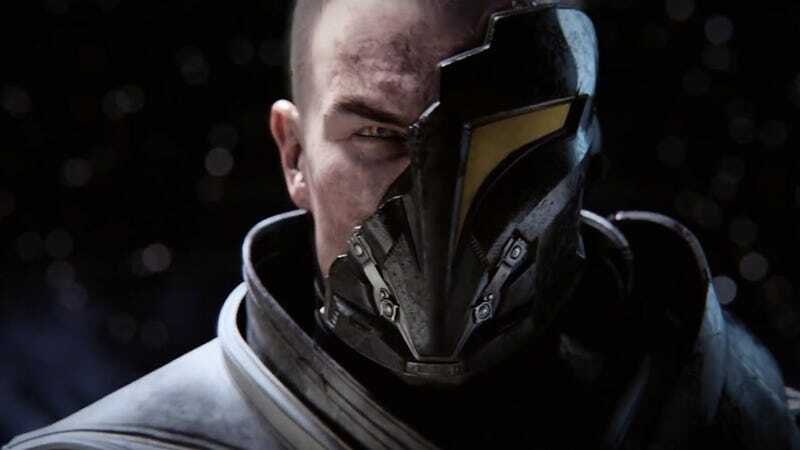 At E3, Bioware announced a new expansion for Star Wars: The Old Republic, dubbed Knights of the Fallen Empire. At its start, players will be frozen in carbonite for five years and when they’re thawed out will find that something called the Eternal Empire came out of nowhere to smash both the Republic and Sith Empire and take control of the galaxy. I don’t know what any of that means, and it appears this new faction is original to this expansion. It’s all very confusing and mysterious, as video game marketing is prone to be. But I do know one thing: it looks like more of the same stuff Bioware has been putting into SWTOR since release, and that’s not a great vibe. Ever since players have hit level 50, with the apparent death of the Sith Emperor, nearly all the new plots Bioware has cooked up have been pretty similar. First we had Darth Malgus carve out a portion of the Empire for himself and then (briefly) wage war against both sides with his splinter faction. Then we had the Dread Masters starting up their own war against both sides. Then we had the Hutts invade Makeb in a resource grab to try to rebuild their own fabled empire. Then we had Revan, again, gathering his cult in a galactic power grab. And now, guess what, another third party has shown up and actually succeeded in taking over everything. This is a stale formula. When SWTOR began it was a tale of a galactic cold war between Sith and Republic, which eventually flamed up into all-out war. At the end of the class quests at level 50, the Republic had struck a serious blow at the Battle of Corellia, thanks in part to the Star Cabal (another third party!) baiting both sides into committing far too many resources to that fight, and in another part to Sith infighting. The whole Makeb thing reset the table a bit as the Empire seized the rare Macguffin resources the Hutts had been after. And then Revan unwittingly resurrected the Sith Emperor in the Shadow of Revan expansion in December, seemingly setting the stage for a revival of the core conflict of the game. There are certain realities that those of us who have played SWTOR for the story long ago had to accept. It’s an MMO, and so Bioware would have to draw out the war for as long as the game existed, and it also was unlikely that it would get a normal big story resolution whenever the time comes to shut the game down because probably EA would not want to through a bunch of resources at an MMO on the way out. A lot of folks has thus assumed the war would just peter out out and the two conflicting societies would eventually merge when the end came. Knights of the Fallen Empire, on the other hand, feels like a reboot of the game. Our original character classes will still exist but now we’re all just The Outlander in this brave new world of the Eternal Empire, and taking us out of action for five years comes off today like a winking nod as the slate is wiped partially clean. Not to mention they’ll let players roll a new toon at level 60 when this expansion begins, something they’ve never done before. Producer Jeff Hickman told me in November that they want to deliver on the promise of SWTOR as a true successor to Knights of the Old Republic, and that along with the current marketing refrain of “a return to Bioware cinematic storytelling” further amplify the sense that this is intended as a fresh start. But the age of developers teasing something new with few substantial details and everybody reflexively jumping on board is over, and SWTOR being a game that we’ve played for years and know very well gives us reason to doubt that what they are going to give us is what we actually do want. As I wrote when Shadow of Revan launched last year, the trajectory of SWTOR is not one that makes me feel optimistic about its future, and mysterious reveals that make it look like the story is going off on another tangent—except this one is permanent—isn’t going to change my mind. I could assume that long-dangling story threads will finally be addressed in Knights of the Fallen Empire, but I could also assume they won’t, based on the last several years of story in SWTOR as well as the actual information we have about it that indicates nothing at all about said dangling threads. Yeah, I’m gonna play this thing when it does come down in October, and I’ll give it a fair shake when I do. But today, given what we’ve seen of it I’d say some strong skepticism is warranted. Bioware has not earned the benefit of the doubt with SWTOR, and much of the rhetoric about storytelling with the new expansion sounds a lot like the sort of things they said about vanilla SWTOR ahead of its launch in 2011. We’ll see, I guess.